These crochet baby mittens featuring the star stitch are completing the Galaxy Set designed for my baby on the way. 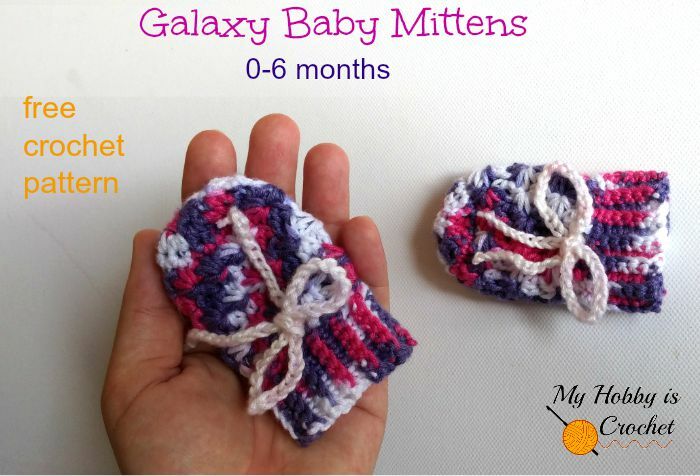 Beside the mittens, the set includes the Galaxy Baby Beanie and the Galaxy Baby Booties. Note: The star stitch would be more visible if using solid colors. The choice is yours; make the hand part in one solid color and the cuff in a contrasting color or a varigated color. Finished Size: 5.5 cm wide and 9 cm long; will fit most babies from 0 to 6 months. - small amount of Cotton Fair Multi Yarn-Valentine and a very small amount of contrasting color for the ties. (From one ball I have made the beanie, the booties and the mittens and I still have a lot of yarn left over). Please see stitch description in the Galaxy Booties pattern. Using hook size 4 mm, make a magic ring. Pull yarn end to close the magic ring. If you do not change colors, do not cut yarn, continue directly with the ribbed cuff, worked in rows back and forth with sc blo. The Ribbed Cuff: Change to hook size 3.5 mm and ch 7. Rows 4- 24: repeat as rows 2-3. Turn mitten inside out; ch1, hold the 2 sides of the cuff together and sl st across through top loops of each side back to mitten edge. Cut yarn fasten off. Weave in the ends. Ties (make 2): With a contrasting color ch 80. Fasten off. Weave in the ends. Insert the tie between the hdc sts of last round below the cuff. 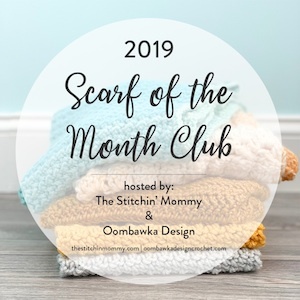 Subscribe to the Free Newsletter and follow My Hobby is Crochet on Facebook, Pinterest , Twitter , Google+ , Instagram and Bloglovin!